You may have already seen my post about the problems caused by feeding wildlife. If not, check it out. Next, I want to tell you a little bit about dassies and maybe show you why they intrigued me so much. Obviously, they're adorable. That's the first thing you think: IT'S SO FLUFFY I'M GONNA DIE! But during my second stint in SA, I met a biologist who was studying dassies and after an hour of brain-picking, the dassie became one of the most interesting animals I've ever known! Dassie isn't their official name. It is an Afrikaans name – from "das" which is Dutch for "badger" – so it's how they were referred to while I was there, and I like it better than it's English name: the rock hyrax. The name hyrax comes from hurax, the Greek word for "shrewmouse." However, dassies aren't related to either of those animals. Not even closely. First of all, dassies are placed within their own scientific order of classification: Hyracoidea, "resembling" hyraxes. The four sole living species of hyrax (2 rock hyrax, 2 tree hyrax) make up the family Procaviidae, "pro-" meaning before and "Caviidae" is the family for guinea pigs. Even that name is misleading, because the dassie's closest living relatives are ...... wait for it ..... elephants and manatees. Once your head stops hurting let me explain. The common ancestor of these animals lived around 37 million years ago, but through ongoing molecular research they remain more closely related to each other than to any other living animals. There are many biological similarities that eventually led scientists to put them together – toenails, padded feet, internal testes – but the biologist I spoke with told me one of the strangest aspects of a dassie's biology: the gestation period can be up to eight months! For an animal that size, that is a huge amount of time in comparison to cats (around 2 months), rabbits (1), pigs (4); even lions gestate for only 3-4 months. That tipped scientists off that the hyrax or its ancestors used to be far bigger. Dassies (specifically the rock hyrax, rather than the tree hyrax) live in rocky places with vegetation only in Africa and the Middle East. They live in colonies of up to 100 dassies, separated by families that consist of one alpha male and what is often described as a "harem" of females, and the offspring they have together. A dassie is weaned within the first month, and they are sexually mature within a year and a half. Baby dassies have to learn how to climb very quickly after birth. Dassie mothers are not very attentive, and colonies usually live on the edge of cliffs and rocky mountains. There are special sweat glands on the pads of their feet that give them great traction, and a healthy dassie can climb a nearly vertical surface. As you can tell from the picture above, they tend to find solitary places that are hard to get to. Like a smelly welcome mat. Most members of a family will have a designated shelter, usually a hole or small cave. The area around each humble abode is used as the entire family's communal latrine, which helps the other families know whose territory they're near. Makes sense, I wouldn't go to someone else's house either if there was poop laying everywhere. This behavior, however, has allowed scientists to study climate changes from up to 55,000 years ago, according to the Guardian. Each colony has sentries to warn of danger. Besides all that crap (couldn't resist), researchers have recently discovered that dassies have their own kind of language. That's what the biologist I met was in the middle of studying. Dassies have up to 30 distinct noises – chirps, wails, squeaks, etc. – and sing songs for communication and wooing a mate that can last for minutes. Patterns started to emerge within the songs, sections that can last up to 30 seconds, and the order in which they made different noises became distinct signifying a syntax. Furthermore, the syntax took on different characteristics in different areas, like an accent. This places them in a very, very small group of mammals with highly organized communication skills like primates, whales, dolphins, prairie dogs, and of course, humans. For something so small and innocuous, dassies have lots of interesting hidden facts! 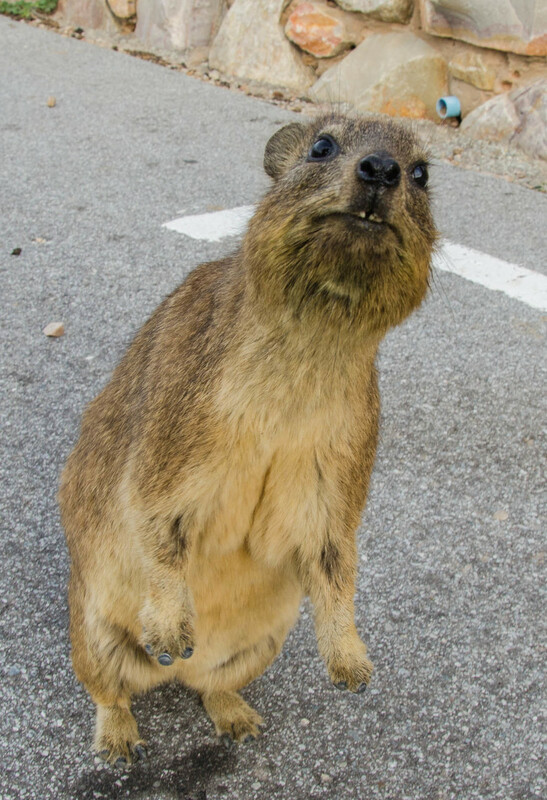 This is a dassie. Please do not feed the dassies. During my time in Mossel Bay, South Africa, I was always intrigued by these fuzzy, little guys running around the rocks along the cliffs of Cape St. Blaize. They blend in so well with the rocks that I wouldn't notice they were there unless they moved, a natural defensive camouflage. There's something about their adorably expressionless faces that always makes me laugh. Though, if you had food (or looked like you did) they would bound up to you in droves. On one hand, this is awesome. I think it's safe to say that most people would relish the opportunity for an up-close encounter with any wild animal, especially one that looks like a large guinea pig. What's the easiest way to get an animal to approach you? Offer it food. When I would visit my grandparents in Birmingham as a child, they would sometimes take me to the park near their house to feed the ducks in the lake. Many of you have probably done something similar. Well as it turns out, many Mossel Bay parents and grandparents take their little ones to the Point to feed the dassies. In the case of the photo below, a woman drove up to the cliffs and threw an entire loaf of white bread onto the rocks. We know that too much "people food" will make our pets sick, but why doesn't that logic continue to include wild animals? I politely asked the bread-chucker why she did that in arm's length from the sign, and she told me that dassies were so dependent on humans feeding them at the Point that they would starve if everyone heeded the restrictions. She said there were fewer dassies around than a few decades before when she brought her kids and grandkids, before the crack-down on feeding. I tried to explain that bread and other processed food aren't a dassies' – or any animal's – natural diet and that it did more harm than good, and that if everyone stopped feeding them, they would revert to foraging for vegetation. There's no lack of vegetation along the cape as you can see, but like your dog begging for table scraps, a dassie would much rather our flavorful food. The woman became defensive, blaming my ignorance on being a know-it-all American, and drove off. I get it, though. I can hear my own childhood logic mirrored in my 4-year-old niece’s voice when she tries to feed my dog people food: “See, he likes it! He probably wants more!” For a moment, this little girl has found a way to connect with a something she normally couldn’t communicate with – an addicting sensation, not unlike how you feel making a baby laugh while playing peek-a-boo. But even if wild animals weren't affected by the change in their natural diet, think about how many things we add to our food. Swans that are fed a large diet of white bread are likely to develop and pass on traits of a condition called "angel wing" in which the wings cannot develop naturally. Read the ingredients of white bread next time you're in the store and you'll see what I mean. Bread can be bleached and loaded with preservatives, and the #1 ingredient on most loaves is "enriched wheat flour." It should be obvious to assume that wild animals can't naturally digest this kind of stuff. I mean, we're in the midst of a huge effort to wean ourselves off this kind of stuff for our own wellbeing, what makes us think animals that haven't been ingesting this for generations could cope any better? However, the consequences of feeding wild animals extend beyond their digestive differences. Once animals learn to take advantage of these newfound sources of food, they begin to lose their natural aversion to humans. Okay, well doesn't that give us the unique opportunity to interact with them? Isn't that worth it? Not so much. Dassies that leave the safety of the rocks to approach humans risk being abused, attacked by dogs, or hit by cars – all of which I witnessed during my visits to St. Blaize. It takes away their camouflage and distracts them from the call of the colony's sentry, the dassie that is tasked as lookout, leaving them more vulnerable to natural predators. Dassies and other wild animals may also carry diseases, and if you hold a bare finger out to one they will bite it assuming it's food. Lyndsay was smart enough not to offer food, but still wanted an up-close look. Obviously, this doesn't solely apply to dassies. Bears raid camping sites, raccoons dig through trash, baboons destroy houses. Human proximity and encroachment into territory that animals have inhabited for thousands of years is the root cause of those kinds of occurrences. I'm not preaching against human expansion (so much) or even against setting up a bird feeder in your backyard (though there are still cautionary steps to take in that regard.) I simply preach caution and self-education. Know and teach younger people the importance of separating wild from domestic. Please do not feed the wild animals. Welcome to Ginger Matt Photography! Thanks for checking out my portfolio! I hope you enjoy the small collection of photos I've taken over the last 8 or 9 years. Check back to this page for semi-regular blog posts on a range of topics, not just photography. If there is anything you'd like me to research and write about, or maybe a photographic technique you'd like to learn, please send me a message and I'll get right on it!